While I love reviewing video games, I am a big fan of wasting my own time so I’ve decided I want to review video game levels. There’s only so much I can touch on in an overall game review and I’m more fascinated with dissecting a game at a more granular level. Spoiler alert: there will be spoilers in these..consider this a parallel to an episode review of a television show. Also, I play different games for different reasons. So a story-based game is going to be weighted heavier towards the story side than a hack-n-slash action RPG. 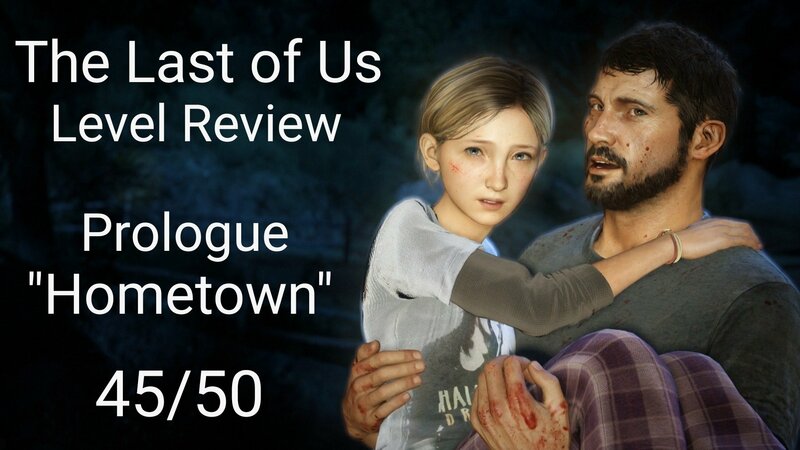 So rambling diatribe over….now here is my review of the prologue to The Last of Us. Naughty Dog sure knows how to draw gamers in. They may be known for huge bombastic set pieces but its the little character moments that makes me a huge fan of their games. The opening conversation between Joel and Sarah is perfectly written and acted and would have seemed at home in a Hollywood movie…if Hollywood movies weren’t trite and cliched. Seriously, this scene is amazing. In a few short minutes, the characters, the relationships, and the tone of the game is thoroughly established and I am completely invested. The sequence in the house and the car ride to town is all about world-building through the atmosphere and surrounding details. I love the newscast cutting out as a plume of smoke shows up in Sarah’s view and the ride by the burning barn. And major shout-out to the sound design. The complete silence in the house and the subtle musical cues in the car ride are great. There is such a palpable sense of dread and doom…and its such a deliciously slow burn. You just know something bad is gonna happen. The ensuing chaos in town with the Infected attacking everyone is a solid actualization of all the tension being built up. Its tense and chaotic and, just like the characters, it is very hard to get your bearings. However, this scene plays a bit like a typical B-movie, complete with a car blowing up a gas station. But its a damn good B-movie because of all the build-up and because of…. …that ending. Wow. Since almost everyone knows structure of this game, the outcome of this scene may have not been too surprising. Still, watching Sarah choking on her own blood while being cradled in her father’s arms never fails to elicit a major lump in my throat. Couple that with the phenomenal soundtrack by Gustavo Santaolalla and you have one of the most powerful moments I’ve seen in a video game. This level is all about introducing the world and conflicts for the characters. Thus, the level design is completely built around that, with most of it being out of the player’s hands or having the player shuttled in a definitive direction. That’s not a bad thing though….its what this kind of level needed. I will say my only problem with this level is I would have preferred a smaller-scale scene than the town being attacked by Infected. I think a scene with Sarah or both Sarah and Joel being chased through their neighborhood by one or two Infected would have been much more effective. Instead we get a chaotic chase through a non-descript town in Texas. I mean I don’t necessarily buy that everything would go bad simultaneously the way this sequence plays out. It plays out a bit like a generic disaster movie. Infected are rated between F1 and F5 on the Fujita Scale. Similar to the level design, gameplay takes a complete backseat to the story here so we only get two small game-play moments. We get the trek through the house as Sarah which plays fairly well and we get the chase through the town. But nothing really stands out one way or the other. Yeah the walk through the house is solid but the chase scene is pretty clunky so all in all its average. This prologue is here to get the player invested in the story and characters and boy does it work wonders! Sure, the gameplay is very minimal here and the level design takes a backseat to the story but the story is why I play The Last of Us. This is probably the most memorable level for me of the entire game. What a great idea to review the levels themselves! You can actually drill down and pay closer attention to detail. Not only that, but you can review the game as you play while it is most fresh in your mind. This opening is just like the ending of the game: one of the best in gaming. Thanks, it’s an idea that I’ve been tinkering with because I love diving into excruciating detail 😀 . I can’t wait till I get to some of the levels that have more nuanced gameplay and set pieces. The prologue is phenomenal but it plays more like a short film.